I spent the day in NYC and snapped some pictures with my cellphone - I rather like how they came out! Here are the rest. You see, the camera on the phone ain't that bad. I want to browse that streetwalk bookshop! As we've kind of done the Hib bush, I'll keep to the Extra & supplementaries within. Me, the no-rules, no-conformity anarchist took a huge liking to this set. Broke the Sharon City Limits & left it behind. this captures a day in NYC, different, with is own kind of big-city atmos & excitement. Well, yeah, you also did Paris, but that was different. This is up front & I applaud you for it. The phone works! I wanted to write about one in particular, but to see it, I have to lose this, so it'll have to wait. Hmmm... I wonder if I could take pictures of people using a phone? Seems sneakier. I love this picture (I like the others too, but really love this one), they guy who is walking has the angle of his legs match the ladder, and the hot babe. 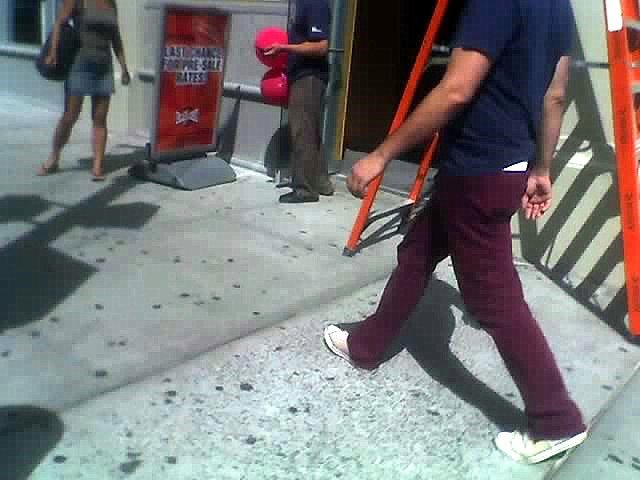 Plus I'm wondering if the third person is holding those pink things, or if there behind them. A lot going on for just torsos and legs! Jugger, taking pictures with a phone is great - people think you're just checking your email or whatever - my camera is big and bulky and hard to disguise! Those pink things are balloons - it was a health club having a grand opening.